HomeLatest News Epson Introduces the New VT6L All-in-One 6-Axis Robot. 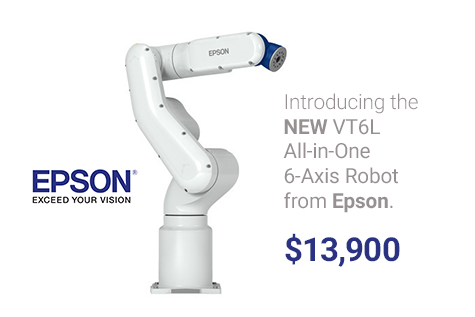 Epson Introduces the New VT6L All-in-One 6-Axis Robot. NEW from Epson. The VT6L All-in-One 6-Axis Robot. With next-level technology, the VT6L All-in-One 6-Axis robot is available at an incredible price of $13,900 with 900 mm reach, up to 6 kg payload and built-in controller. It includes many of the features found in Epson’s high-end robots, including powerful Epson RC+ development software and easy integration tools. Contact FPE Automation for more information.